3301 South 72Nd Street, Omaha, NE, U.S.A. 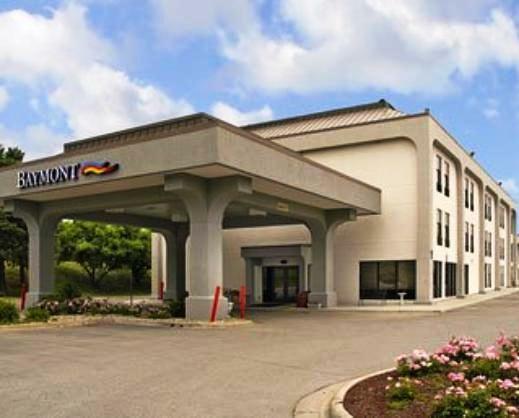 Located about a 3-minute drive from the nearest Interstate 80 on-ramp and a 6-minute drive Omaha's city centre, the Baymont Inn and Suites Omaha NE is geared towards business or vacation travellers who require an economical hotel with a free breakfast and easy highway access near the city's centre. Each air-conditioned guest room at this hotel offers free Wi-Fi, cable TV, a coffeemaker, a desk and a hair dryer. Rooms with a microwave, a mini-fridge, a sitting area with a sofabed and a jetted tub are also available, as are wheelchair-accessible rooms. The hotel also offers a fitness room, meeting/conference space, a business centre, vending machines, guest laundry, free parking and a free breakfast. Pets are permitted for an additional $10 per pet, per day. The majority of the reviews sourced for this analysis were positive, with much praise going to the hotel's value, breakfast, staff and rooms. Many reviewers praised the hotel's value, describing the rates as affordable, fair, very good and well priced. These guests also cited the free breakfast and free Wi-Fi as contributing to the hotel's overall worth. Numerous patrons enjoyed the hotel's free breakfast. They described it as above average, delicious and healthy, with a good variety of hot and cold items and a nice breakfast area. The hotel's staff were the source of several compliments by guests. They were found to be friendly, accommodating, responsive and helpful with restaurant recommendations. Several lodgers were pleased with their accommodations at the hotel. They described their rooms as clean, well equipped and functional, with comfortable beds and linens and good water pressure. It should be noted, however, that some reviewers were disappointed with their rooms (see below). While the majority of reviews consulted for this analysis were positive, there were some complaints about the rooms. Although several guests enjoyed their well-equipped and functional rooms, some reviewers had complaints about their lodgings. They reported worn furniture, dated decor, some cleaning issues, cigarette odours in non-smoking rooms and some noise transfer from guests in rooms overhead. Hotels.com guest reviews rated the hotel 3.2 out of 5 from 148 reviews. TripAdvisor.com guest reviews ranked the hotel #50 of 69 Omaha hotels with an average rating of 3 out of 5 from 96 reviews. Expedia.ca guest reviews rated the hotel 3.1 out of 5 with a 72% recommendation rate from 88 reviews. The author called the hotel on September 3, 2013 to verify some information. Rating: #12 out of 71 hotels in Omaha ranked by guests.